A production process developed at Fraunhofer could take up to 70 per cent off the cost of manufacturing infrared lenses, researchers claim. The development could lead to cheaper thermal-imaging cameras that are currently fitted as a safety feature in luxury cars and can cost up to €2,000 (£1,580). Such cameras, or microbolometers, detect infrared rays and warn motorists driving in poor visibility of obstructions through an acoustic signal or a warning light. ‘We have developed a production process for lenses that enables us to lower the costs of these components by more than 70 per cent. Thus the prize for the microbolometer could be reduced,’ said Dr Helen Müller, scientist at the Fraunhofer Institute for Mechanics of Materials IWM in Freiburg. According to a statement, the lenses are normally made out of crystalline materials such as germanium, zinc selenide or zinc sulphide. These materials are expensive and can only be processed mechanically through grinding, polishing or diamond turning to shape them correctly. To make the components, the researchers place the chalcogenide glass between two pressing tools that determine the form of the required lenses. It is then heated and formed between both pressing tools. After a few minutes, the glass is cooled again to below the softening temperature and removed. In contrast to conventionally processed optics, the lens no longer has to be further refined. 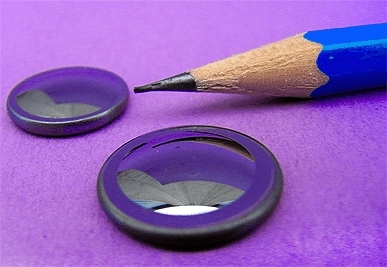 Lenses manufactured this way are claimed to exhibit the same excellent optical imaging quality as those that are polished. To ensure that no glass remains attached to the tools, their surface is coated with anti-adhesive, non-stick coatings. The scientists now want to further refine the process towards cost-effective mass production. Mirror lenses would be cheaper still and transparent to all wavelengths.